The TROPIC trial was a randomized, open-label, international, multi-center study of JEVTANA 25 mg/m2 (n=378) vs. mitoxantrone 12 mg/m2 (n=377) in patients with mCRPC previously treated with a docetaxel-containing treatment regimen. 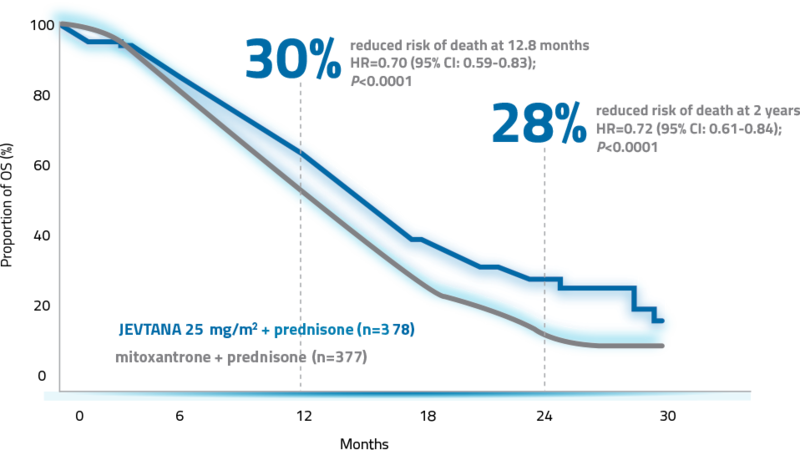 The primary endpoint was median overall survival. 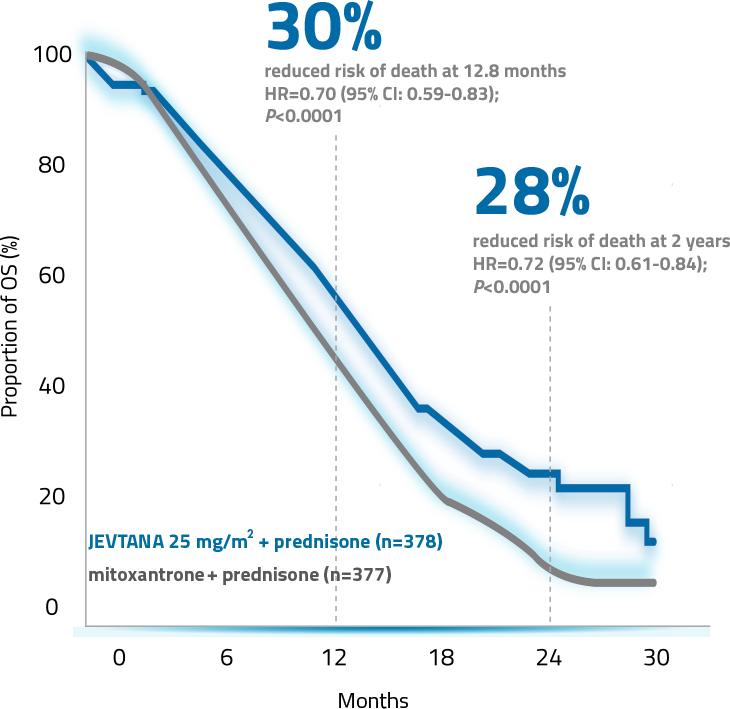 12.8 month follow-up: 15.1 months (95% CI: 14.1-16.3) median overall survival for patients receiving JEVTANA 25 mg/m2 vs 12.7 months (95% CI: 11.6-13.7) with mitoxantrone (P<0.0001). Number of deaths were 234 (62%) with JEVTANA vs 279 (74%) with mitoxantrone. 2-year follow-up: number of deaths were 350 (93%) with JEVTANA vs 366 (97%) with mitoxantrone. Due to study limitations, the 2-year advantage is the probability of survival with a data cutoff of March 2010. The PROSELICA trial was a non-inferiority, multicenter, randomized, open-label study of JEVTANA 20 mg/m2 (n=598) vs. JEVTANA 25 mg/m2 (n=602) in patients with mCRPC previously treated with a docetaxel-containing regimen. The primary endpoint was overall survival. Bahl A, Oudard S, Tombal B, et al, for the TROPIC Investigators. Impact of cabazitaxel on 2-year survival and palliation of tumour-related pain in men with metastatic castration-resistant prostate cancer treated in the TROPIC trial. Ann Oncol. 2013;24(9):2402-2408.